The Colorado Avalanche have just resigned center Matt Duchene to a two-year, $7 million deal, a great deal for the team. The Avs have done a good job locking up their players this offseason, having already agreed to deals with forward David Jones, defenseman Matt Hunwick and captain Milan Hejduk. But this deal is the best they’ve made so far. Just look at Duchene’s stats so far in his career: Due to knee and ankle injuries, Duchene played in just 58 games while tallying 14 goals and 14 assists. 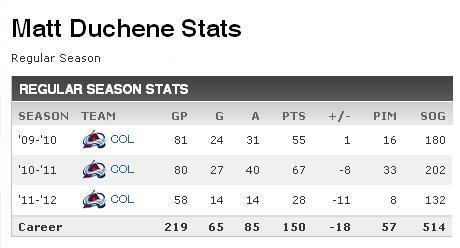 While those stats make the deal seem like fair value, Duchene’s first two years in the league demonstrate his true worth. The third-overall pick in the 2009 draft tallied 51 goals and 122 points in the two years while missing just three games. The best part for Colorado: Duchene is just 21 years old. That means he still is going to improve quite a bit. There’s no reason that he cannot score 35 goals and dish out 50 assists each season for the next few years. If Duchene had had those stats this year, he would have been fourth in the league in points and tied for 11th in goals. That’s an entirely realistic target for such a young player and yet Colorado is paying just $3.5 million per season for him. The injuries are certainly worrisome, but if Duchene stays on the ice, this will be a great deal for the Avs. I’m curious to find ouut what blog platform you have been working with? Do you have anny suggestions?